Upper Deck has always worked to bring collectors closer to the game with regard to the products they bring to market and the collector-focused programs they have in place. 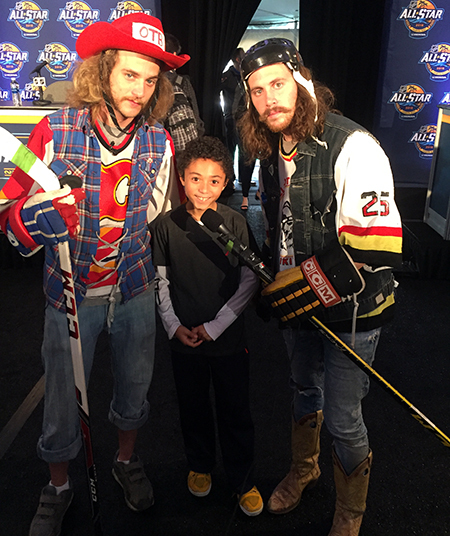 One such program is the Kid Correspondent the NHL® has allowed Upper Deck to begin. 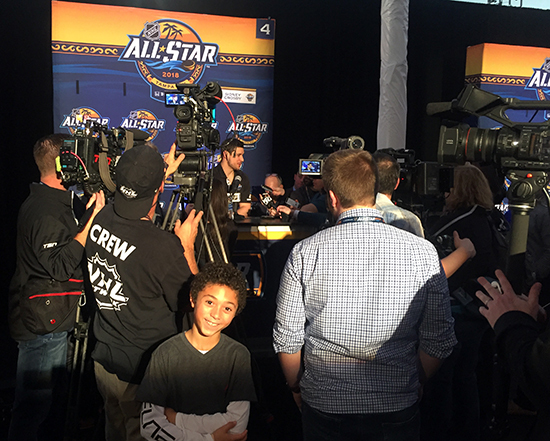 Upper Deck worked to find a deserving youngster to get unprecedented access at the NHL® All-Star Media Day. 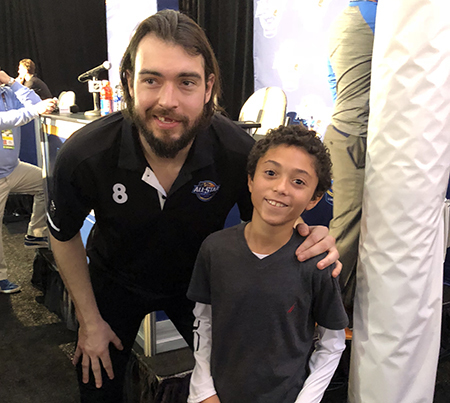 Jaxson Shandler, a ten-year-old from West Palm Beach, Florida was hand-picked to become Upper Deck’s Kid Correspondent because of his passion for the game, his love of hockey cards and his outgoing personality. 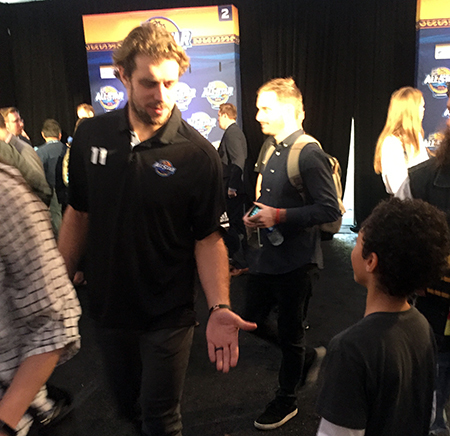 Jaxson had already had a great time at Fan Fair, but was poised to experience something special at Media Day. 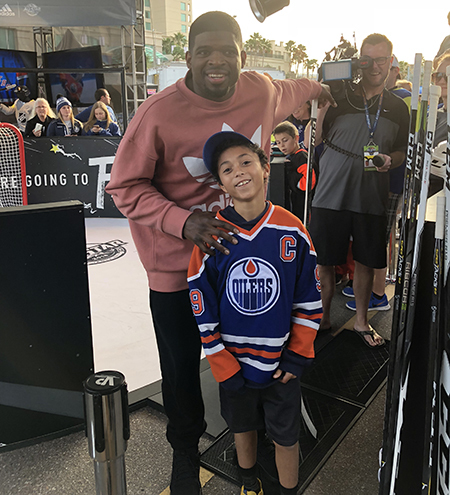 Jaxson Shandler was thrilled to meet P.K. Subban by chance at the NHL All-Star Fan Fair. 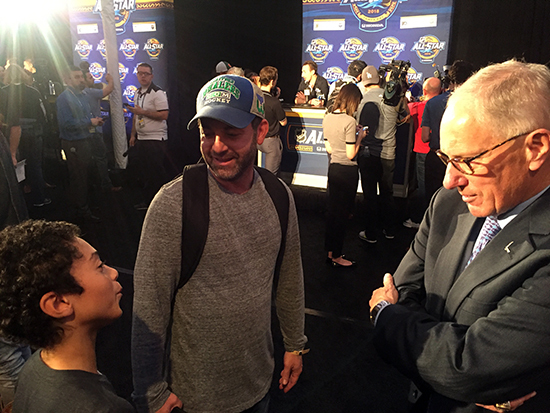 Jaxson’s father Jason is a former sports reporter and he gave his son a variety of pointers the night before like speaking up, looking the player’s in the eye and asking open-ended questions that let them player talk about a subject longer. 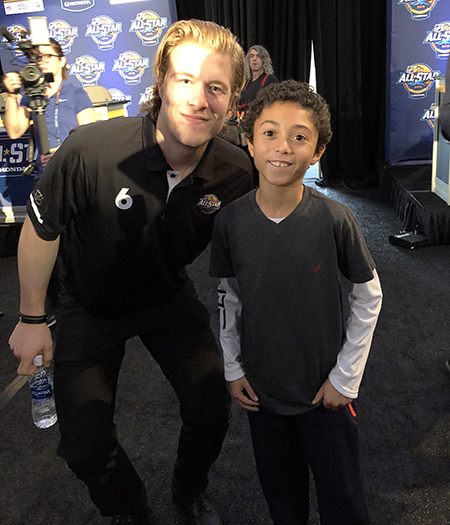 Jaxson also got the chance to talk to some media in attendance and he had a memorable exchange with legendary broadcaster Mike “Doc” Emrick. Doc and Jaxson had a nice conversation about how much Jaxson likes listening to his calls. He also learned what not to do from the dynamic duo from On The Bench. 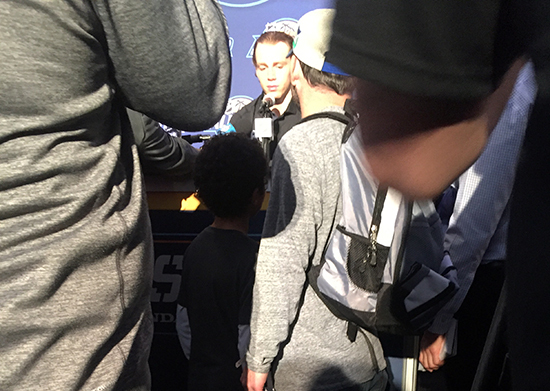 Jaxson stuck out a little bit as he was a bit smaller than other reporters. Being small had some advantages however as Jaxson was able to slip in where other reporters couldn’t. Pretty tough to get through all the media present. Want to get near Sidney Crosby? Good luck! Jaxson found his spots though! 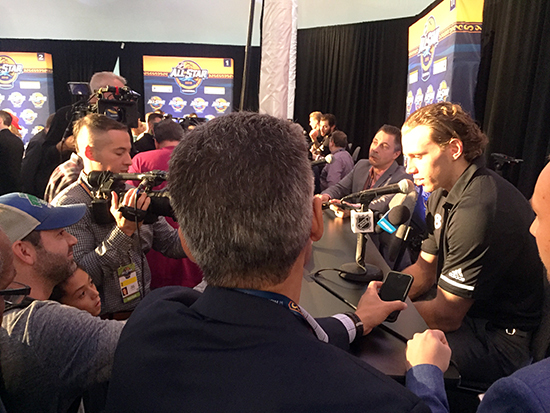 Getting to ask Patrick Kane a question was a big thrill for the young man from West Palm Beach. And a photo after was the cherry on top! 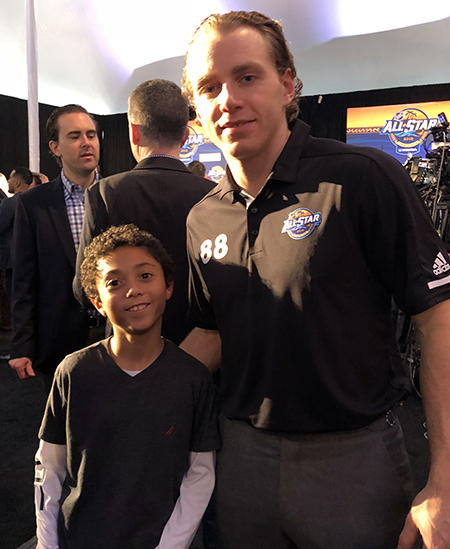 Getting to have an exchange with Patrick Kane and ask him what tips he had for a young player was incredible. Kane shared that he should try to play on as many teams as he can and just develop a true love for the sport. 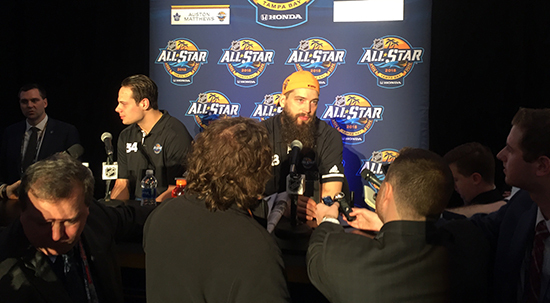 Then it was one to one of the giants in the game by getting to ask Brent Burns a couple questions which was a lot of fun. 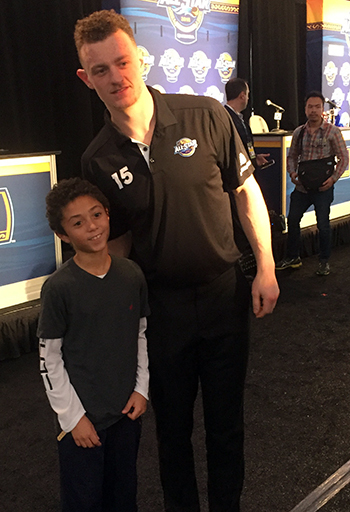 Then it was on to one of Jaxson’s local favorites as he got some facetime with Brayden Point. 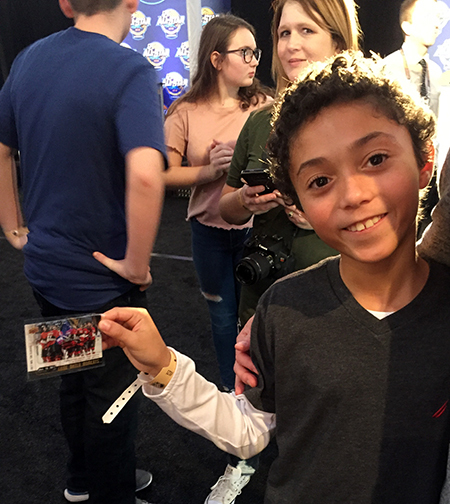 Jaxson shared an Upper Deck Game-Dated Moments card of Jaromir Jagr with Aleksander Barkov of the Panthers who talked about what it was like playing with him. 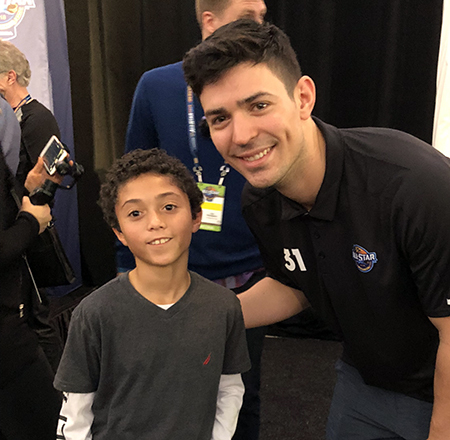 Then came a bevy of incredible photo opportunities and meetings with some of the games top stars including Sidney Crosby who asked, “Are you working today?” Indeed he was Sid! 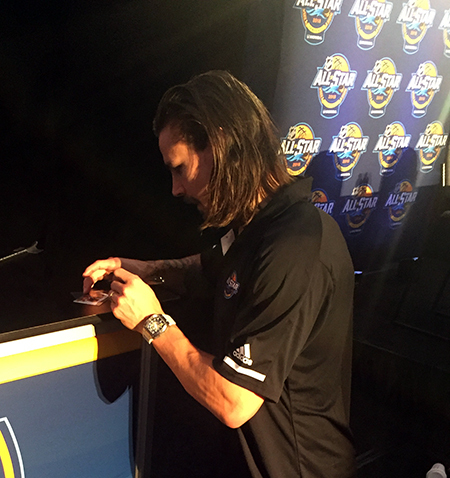 It ended in a memorable fashion as Jaxson presented Erik Karlsson with an Upper Deck Game-Dated Moments card from the NHL 100 Classic. 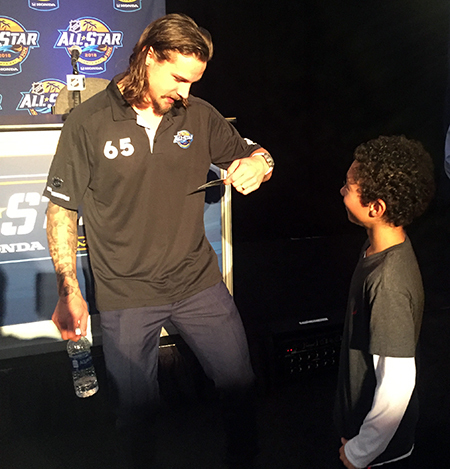 Karlsson talked about the game with Jaxson, then signed the card and gave it to him. 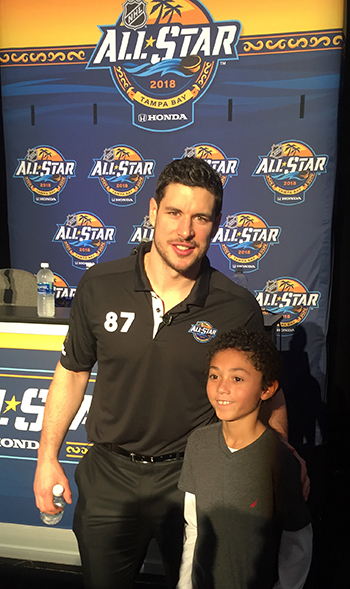 After all his work was done, Upper Deck and the NHL® shared a variety of great items with Jaxson for his efforts. What was the experience like? Watch as Jaxson and his father talk about it! The 2018-19 Game Dated Moments Rookie of the Month – February Achievement is Now Live on Upper Deck e-Pack®! 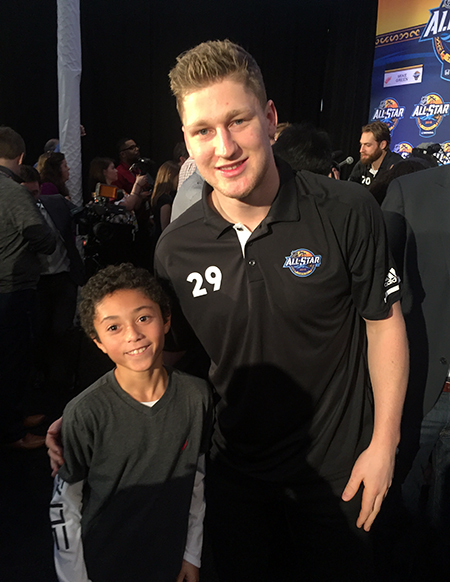 Awesome kid…what an amazing experience to offer a hockey fan! A true blessing to him…Great work Upper Deck!! Thrill of a lifetime for that kid…so cool.